By Bruce Beck, Imperial College London and Michael Thompson, IIASA Risk, Policy and Vulnerability (RPV) Program. 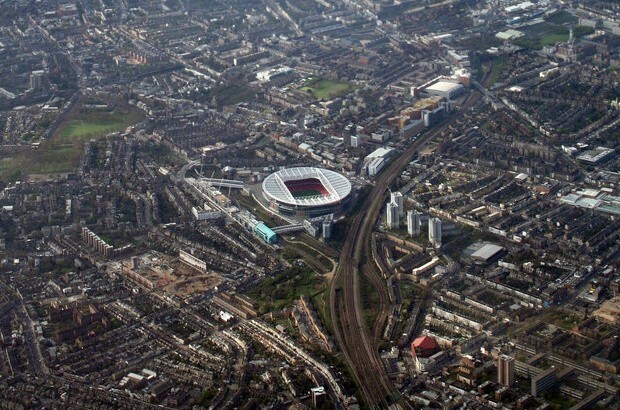 What do Arsenal’s Emirates Stadium in London, the now glorious heritage of Islington’s housing stock, and the cable-car system in Kathmandu for getting milk supplies to that city, all have in common? They are (or were) all transformative in their own way. All are commendable outcomes from the process of city governance that we argue will be essential for Coping with Change, the subject of our working paper for the Foresight Future of Cities project. Each is a primary case study in the analysis of our paper. We call this kind of governance ‘clumsiness’. It is something that does not evoke any sense of the familiar attributes of suaveness, elegance, and consensuality implied and valued in most other kinds of governance. So what, then, makes this thing with such an awkward, provocative name so relevant to the future of cities? 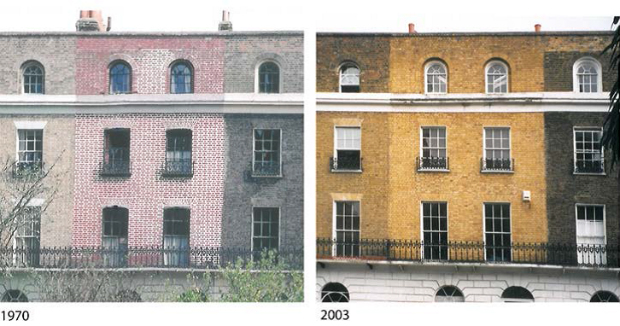 Before and after: Islington’s clumsy and resilient resurgence. Imagine the city being buffeted about by all manner of social, economic, and natural disturbances over time. There will be times for taking risks with the city’s affairs, and times for avoiding them, or managing them, even just absorbing them – 4 mutually exclusive ways of apprehending how the world works, as it were, and 4 accompanying styles of coping. In the financial industry, this risk typology has been referred to as the 4 seasons of risk. These are strategically and qualitatively different macroscopic regimes of system behaviour; coping with change between one and another of them is every bit as strategically significant. Conventionally, we recognise only 2 of these regimes: those giving rise to boom and bust in the economy. They reflect just 2 of the 4 ways of understanding the world and acting within it. The nub of the distinctive advantage of clumsiness over other forms of governance for coping with change and transformation is the richness of its (fourfold) diversity of perspective, from which may derive resilience and adaptability in the city’s response to any disturbance – big or small, economic, social, or natural. Clumsiness is most assuredly deeply participatory. Its process is assiduously supportive of robust, noisy, disputatious debate: witness the gyrations in the Arsenal, Islington, and (especially so) Kathmandu case studies. This is exactly as one should expect of any meaningful engagement among the city’s stakeholders: the public-sector agencies, community activists, private-sector businesses, and so on, all with their own vested interests. The 4 ways of seeing the world are mutually opposed; each is sustained in its opposition to the others, as will be the shaping of their aspirations for the future. Each needs the challenges from the others, not least to avoid the ‘group-think’ in governance that is of such considerable concern to government in managing financial risk. At the peak of deliberative quality in governance, all 4 outlooks are granted access and responsiveness in the debate, in the process of clumsiness, in other words, in coming to a decision or policy — with ever higher social consent. And in the clumsiest of outcomes, each opposing group gets more of what it wants, and less of what it does not want, at least for a while, until everything about the city’s affairs is revisited once again, as the various seasons of risk come around, each holding sway in turn. As we say in our working paper, clumsiness is why village communities in the Himalayas and Swiss Alps have remained viable over the centuries, without destroying either themselves (‘man’) or their environments (‘nature’) – sustainability par excellence, in other words. So now we must ask: can cities be viable and sustainable in the same way as these mountain villages? In particular, how can the city’s built environment – the infrastructure that mediates between nature and man, the natural and human environments – be made resilient and adaptable, especially in an ecological sense? Thus might we possess this much prized attribute of systems behaviour in each of the natural, built, and human environments, and in a mutually reinforcing manner. What role might clumsiness have in all of this? In closing our working paper, where we “connect the systemic dots” of our entire argument, we touch upon a computational foresight study in seeking a smarter urban metabolism for London. The fourfold typology of clumsiness is employed to define future target aspirations for the city (quantitatively expressed, under gross uncertainty). These should be the distant outcomes of the fourfold narratives of how the world is believed to work and what it is that each attaching vested interest much wants – and decidedly does not want. An inverse sensitivity analysis (redolent of a computational backcasting) identifies what is key (and what redundant) to the ‘reachability’ (or not) of each of the 4 sets of aspirations for the distant future. Imagine then the urine-separating toilet (UST) as the clumsy solution to a smarter metabolism for London – a smarter way, that is, of the city’s processing of the resource flows of water, energy, carbon, nitrogen, and phosphorus passing through its social-economic life. Rather more grandly put, imagine instead the UST as a “privileged, non-foreclosing policy-technology innovation” for today! Well now … if clumsiness is such a jolly good thing, what else might it do for us and our cities? We submit it promises the prospect of greater resilience and adaptability in the governance of innovation ecosystems, extending thus the lines of evidence recounted for re-invigoration of the industrial economy of NE Ohio in Katz & Bradley’s recent (2013) book Metropolitan Revolution. ‘Resilience’ and ‘ecosystem’ are (for now) ubiquitous in our everyday language. But no-one, as far as we are aware, has thought of applying the immensely rich notion of ecological resilience to orchestrating the creative and clumsy affairs of an innovation ecosystem. We are currently examining this. Featured image by Peter McDermott. Used under Creative Commons.